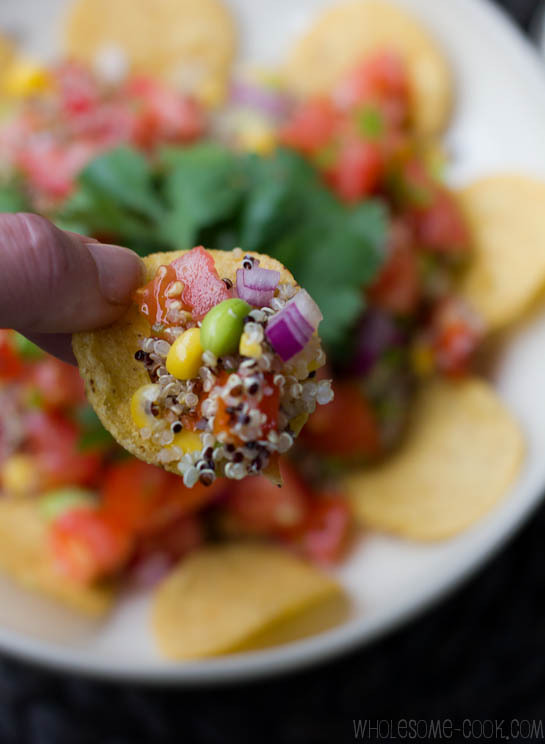 These Quinoa Nachos are super tasty and nutritious. 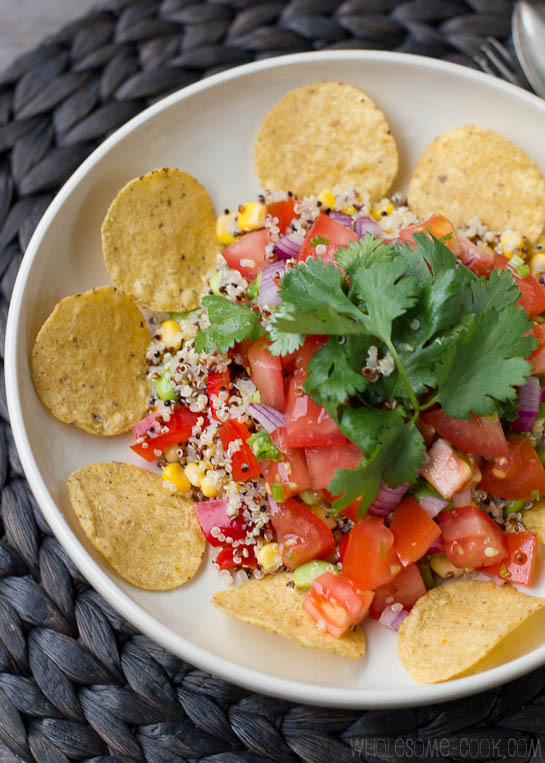 Omit the corn chips if you prefer, but always top with tomatoes, coriander (cilantro) and jalapenos in the form of Pico de Gallo, a Mexican salsa! Perfect to make a day or two ahead, divide into small containers and take a batch to work each day. If you’ve been following me on Instagram (and for a closer look at my recipe experiments, travel, culinary adventures and so forth, I encourage you to), you probably know that earlier this month we spent 2-and-a-bit weeks in the US. Our first stop was Las Vegas, not my top choice of American cities to visit, but Mr was attending a conference and so we had to go. Dinner at L’Atelier de Joel Robuchon – amazing if you ever have a chance, almost made up for the severe allergy we’d developed from all the cigarette smoke around, sigh. From there we were onto San Diego, thankfully because by that stage of the trip I needed some real food which I probably only got to eat a couple times at dinner in Vegas. Needless to say, within hours of arriving at W San Diego, I had emptied out the minibar fridge, and proceeded to stack it like so, with all things edible I picked up from a nearby Ralph’s supermarket: raw carrots, broccoli, celery sticks, unsweetened Greek yoghurt which I found extremely hard to find, and what I’d discovered to be the only salad lunch I would have for a week: a mixture of quinoa, soya and corn topped with pico de gallo. Oh my! So tasty and filling. And a new staple in my lunchtime salad repertoire, it seems! While I don’t have the original recipe, I thought I’d share the nacho version with you – a serving suggestion I “discovered” accidentally. Since I forgot to pick up a spork from the shops and there was no cutlery in the room, I resorted to scooping up the quinoa salad using organic corn chips! Perfect really… So, tell me, dear reader what are your favourite healthy snack-foods? And have you ever re-stocked your minibar fridge with real food for snacking or do you like to indulge in some room service while away? 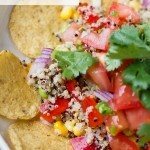 These Quinoa Nachos with Pico de Gallo are a great starter, main meal or a salad lunch. You can make the quinoa and salsa a couple of days ahead. Feel free to add other fresh veggies to the mix: cucumber, raw zucchini, blanched green beans or tinned red kidney beans. Rinse quinoa thoroughly under cold running water. Transfer to a small saucepan and add the water. Bring to a boil over medium-low heat and cook for 15-20 minutes or until the grains are tender. In the last 5 minutes of cooking add frozen soya beans. Drain both over a sieve and set aside to cool. Transfer cooled quinoa into a large bowl. Add corn kernels and capsicum. Prepare your pico de gallo. In a medium bowl mix together the tomatoes, onion, coriander (cilantro) and jalapeno. Add olive oil and lime juice. Mix well. Spoon quinoa mixture into the middle of a serving plate or bowl. Top with pico de gallo and extra coriander leaves. Serve with corn chips on the side. Yum! This looks like a great summer version of nachos! 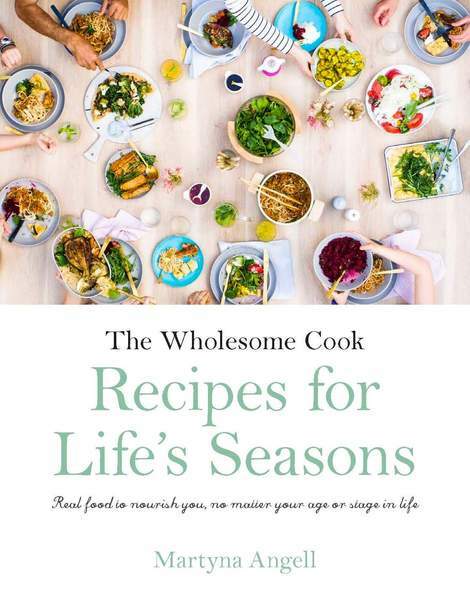 How delightfully healthy – I love it! Ole! Love your lighter version of this tex mex special. I was working on a program in North Queensland for 2 months a while back, and after too many pub meals, did the same. I go to dinner, eat a salad and then go back to our room and eat fresh deliciousness from the fridge. Your body just starts craving fresh food doesn’t it? I’m glad to hear you did it too! 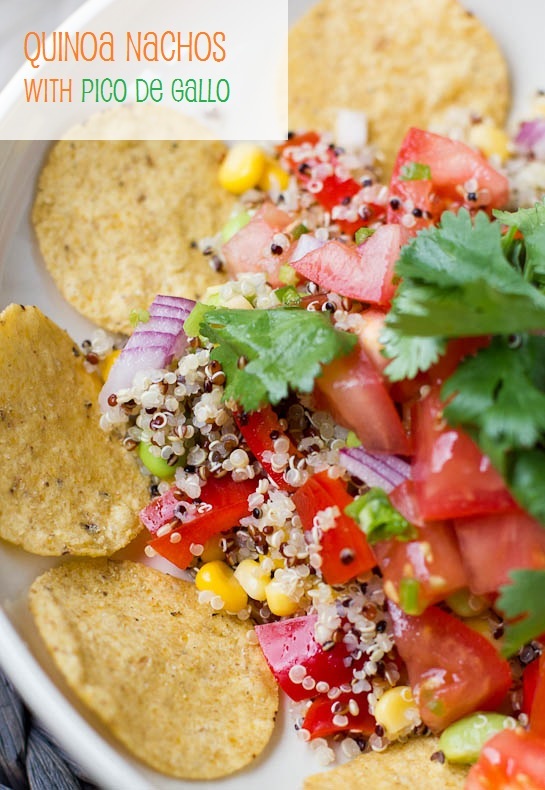 I love this healthy twist on nachos!